There’s no Caribbean kitsch at new Jamaican restaurant Rudie’s, where elegant wooden columns subtly mimic the shape of palm trees, a cool collection of vinyl provides the soundtrack and Caribbean classic dishes are given a fresh and modern spin. Jerk is key to the menu, but jerk lamb is Rudie’s own innovation, alongside the more usual chicken and pork. Fried calamari (not a Jamaican standard) is also given the jerk treatment – dipped in lime sauce it’s fantastically light but warming. Jamaican national dish ackee and saltfish comes as a small plate so you can mix it up with other flavours, and Rudie’s own bammy – grated cassava flatbread – has a healthy Italian-style herb and tomato topping. The one traditional dish that remains unadorned is the richly flavoursome goat curry – the goat meat comes from nearby Ridley Road Market. 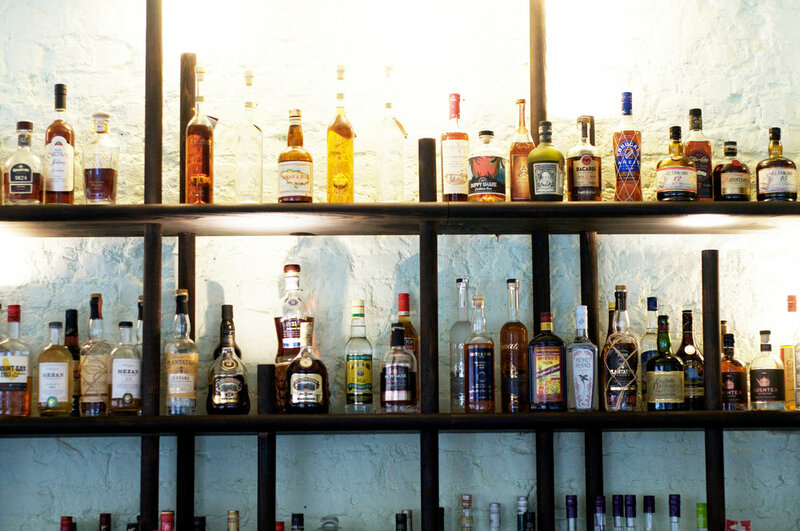 Rudie’s rum-soaked cocktail list is inspired by Jamaica’s history: there’s a colonial option with Brandy de Jerez and tea from the Indies, the Selassie I mixes Ethiopian coffee with rum and Tia Maria, and there’s a boozy homage to Dr No which was filmed in Jamaica. Laptopistas looking for a new daytime berth in the borough can make use of free wifi and explore a unique coffee offering, with specialities such as cold brew coffee infused with chili and lime. There’s also a healthy daily juice, such as pineapple with a Scotch bonnet kick. Rudie’s has big plans for 2016, including a vinyl club, Jamaican Sunday brunch and monthly basement reggae parties – and you’ll soon be able to order a Blue Mountain coffee here. The jerk recipe is a secret, but Rudie’s has provided Eat Hackney with versions of the most popular Jamaican dishes, so you can cook your own ackee and saltfish and rice n peas. Otherwise, head down to this warm and friendly little restaurant for a spicy lunch or dinner, or make a date at Irie Hour (Mon-Sat 5-7pm & 10.30pm-late) for a two-for-one rum punch or island classic cocktail. Tasty! Drain the liquid from the kidney bean can and reserve, then mix with the coconut milk and enough water to make up 500ml. Add the liquid to a pan with the thyme, nutmeg, spring onion and garlic, then season with salt and pepper. Add the rice and bring to the boil for two minutes, then reduce to simmer for 15-20 mins until all the liquid is absorbed. Soak salt cod overnight and poach it in plain water on low simmer for 10 minutes until just cooked (still translucent) and set aside to cool. In a frying pan heat the oil and butter, add chopped onion, garlic, peppers and thyme. Cook down for 10 minutes until nicely wilted, then add lemon juice, fish stock, scotch bonnet and a pinch of sea salt and black pepper to taste. Cook down until the liquid has reduced and forms a light sauce. Remove from the heat and add the saltfish, warming it through (be careful not to break it up). Add the drained ackee and stir through once or twice, and serve garnished with fresh parsley and a squeeze of lemon juice.